It’s a small gathering: my wife, my sister and her husband, and me. My bride is very sensitive to bitters and amari, and just plain doesn’t like sweet vermouth, so any normal recipe strategy is a non-starter from the get-go. To add richness to the puzzle, my brother-in-law doesn’t really like sweet drinks (neither do I), and my sister is a Negroni drinker, not naturally attracted to sours. So that’s interesting. After some pleasant iterations, we set aside the maple, added some citrus interest, and ended up with two workable candidates for Thursday’s cocktail menu. It was fun to work out new recipes, and I was eager to name them and publish them here. I subscribe to the theory that there are no “new” new drinks, only variants of things already known, and these offspring should be named to reflect their heritage, the way race horses are named to suggest their lineage. I began my research to see whose family tree I was climbing. Hours of googling and page turning turned up nothing. That was exciting—I was sensing that my “new” new drink theory was crumbling to my advantage; original invention is a heady concept for a beginning cocktail designer. Shake with ice and strain into a rocks glass with ice. Garnish with a slice of orange and a wedge of lime. According to Felten, the Bardstown Sling was the winner of the 2004 Kentucky Bourbon Festival’s Mixed Drink Challenge. Alas! that he doesn’t give us the name of its maker. Shake with ice; strain into a chilled cocktail glass. Garnish with orange. This version has a slightly larger proportion of bourbon (how could the Kentucky Bourbon Festival have missed that opportunity? 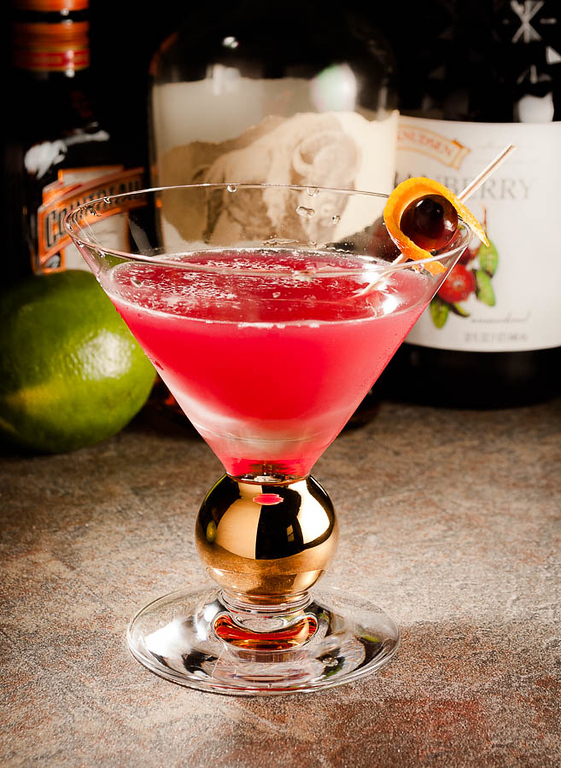 ), and uses straight cranberry juice to amp up the tart berry flavor and avoid some of the corn-syrup sweetness of “cranberry cocktail” products. That sweetness works in Cosmopolitans; it doesn’t work here. Optionally, you can make a pleasant tall drink with this same recipe, a sort of “Bardstown Collins,” by serving in a tall glass over ice and topping up with soda. Shake with ice; strain into a chilled rocks glass. Express with orange, rub the glass rim with the peel, and add into the drink. Ice cube optional. I’ll grant that this plays fast and loose with the canonical Old-Fashioned. It follows the seam between Old-Fashioneds and Sours. But it works. And if you get proper cranberry juice, it’s an inspiring color of red. So I didn’t exactly fulfill my “new cocktail” commission, but I did come up with something that the family will enjoy, and I had a lot of fun doing it. “Cranberry and Bourbon: Reinventing the Bardstown Sling” at cold-glass.com : All text and photos © 2011 Douglas M. Ford. All rights reserved. Just found you online and this looked so inviting that I had to try it. Thank you. It’s delicious! I add 2 dashes of some homemade cranberry-anise bitters and whoa. Well done. I’ve been looking for some great cranberry-bourbon recipes, so thanks for these ideas! Some R&D is obviously required. Bardstown is certainly one of my favorites so far, I hope you enjoy it. Thanks again for the ideas! Looks good, Dave; I look forward to giving it a try. Triple sec works great! Just cut back on the lime, but don’t leave it out altogether because it adds an aftertaste of diminished tartness that is quite refreshing. My bf poured whisky over ice for me one night this week. It was alot, about half a stemless wine glass. He had a rough day at work lol. When I said I didn’t wait it, he stuck it in the freezer. Three or four days later, I saw it still in there and pulled it out, worried it had cracked the glass or something. The glass was fine and as the ice started melting, I noticed it developed a weird shape and consistency, almost like a slushie. I stuck the glass back in the freezer until last night when I felt inspired to make a cocktail. I squeezed 3 cuties on top of the whisky and ice slushie, added a generous pour of organic cranberry juice (no sugar) and then I added a 1 inch by 1/2 inch by 1/2 inch piece of ginger, shredded down to fine little pieces. Gingertown Sling, I like that! And the ginger component with the juice and whiskey is intriguing, I’ll have to experiment with that. Thanks! It’s cold out, and I’m averse to getting in the car anymore today. I was armed with lemons, but no limes. Can we call the lemon variation the Bardstown Schwing? Why not? Go for it. Pomegranate would make an interesting substitution here.